BILLMARK - Rome (Ponte Rotto). BILLMARK, C.J. - Rome (Ponte Rotto). Rome (Ponte Rotto). - BILLMARK, C.J. Title : Rome (Ponte Rotto).. 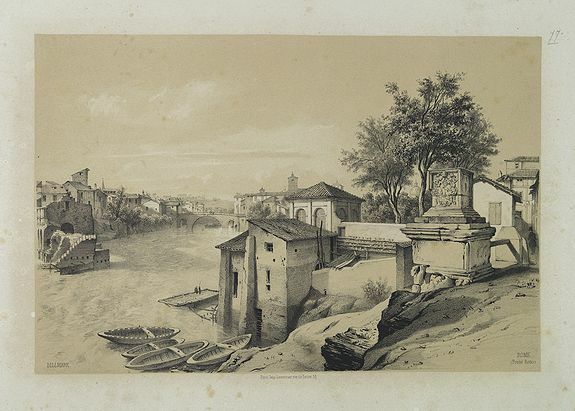 Description :Uncommon and picturesque lithography of Rome with a view of the Rotto Bridge. Published by Carl Johan Billmark and printed by Lemercier in Paris, 55 rue de Seine, the leading firm in Europe at that time. From: Itinéraire Pittoresque de Stockholm à Naples . . . Dessinées d'apres nature en lithog. Par C.J.Billmark. Sold by J.C.Hedbom in Stockholm, Quaranta in Naples and Goupil & Vibert in Paris. This plate is uncolored which gives an unique opportunity to study Billmaks lithographic skills. Condition : Lithography on tinted ground. Some mainly marginal foxing. Else in very good condition.